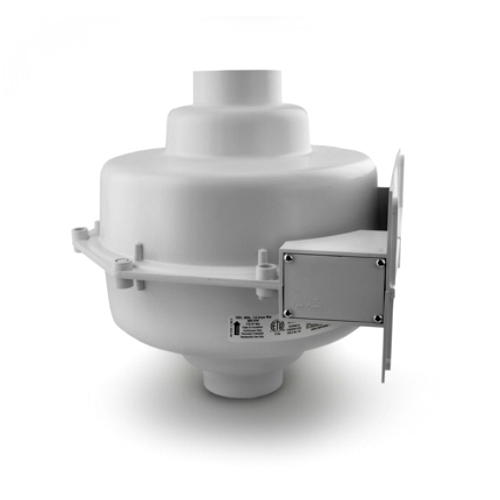 Radonaway GP fans are high suction low flow fans to be used with tight soil conditions. However, just because you think a difficult situation exists, it won't be truly evident until you put a hole in the floor. Then, an accurate assessment can be made of your soil conditions. There's no sense buying the biggest fan only to find out that you could have used a 50 watt high flow model. If you want some help please go to the Radon Mitigation DIY page and fill out the form at bottom of the page. The GP501 is designed for tight soil conditions and when suction points are limited. With a maximum pressure of 4.3"WC this fan is always on my truck for the tough jobs! Normally used with 3" PVC. Not good where high air flow is expected. The GP501 is rated at 70-140 watts. The GP401 is slightly less aggressive with a max pressure of 3.4"WC. But the energy savings can be substantial if this fan works for you. Power rated at 60-110 watts. Usually used with 3" PVC duct. This could be a good choice with medium to tight soils and where multiple suction points can be used. The GP301 is a medium suction fan rated at 2.6"WC. Power rated at 55-90 watts. Usually used with 3" PVC duct. This could be a good choice with medium to loose soils and where multiple suction points can be used. 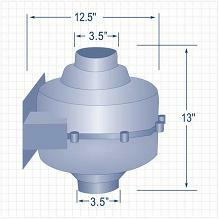 The GP201 is a medium suction fan rated at 1.8"WC. Power rated at 40-60 watts. Usually used with 3" PVC duct. This could be a good choice when gravel is found under the floor and with a small basement....<1000sq/ft. Also good for activating a 3" passive vent in a small basement.